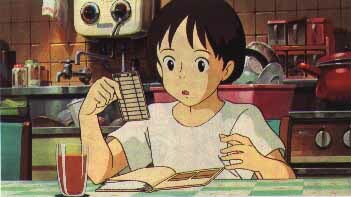 Mimi wo Sumaseba (Whisper of the Heart) anime by Studio Ghibli and manga series by Hiiragi Aoi images and info. Part of a diverse shoujo anime, manga, video gaming, and live-action Japanese drama website. 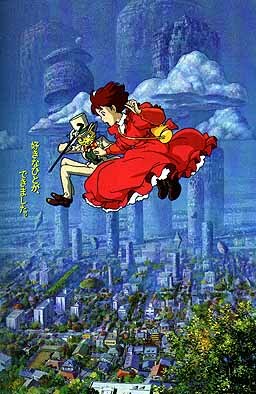 "Mimi wo Sumaseba" is the ONLY manga (other than Miyazaki Hayao's own & the Yamada-kun comic strip) with the distinction of being animated as a Studio Ghibli film! 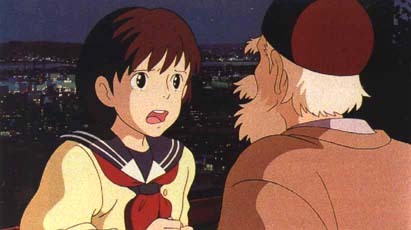 The movie is also known by the title "Whisper of the Heart". The manga is by Hiiragi Aoi (Hoshi no Hitomi no Silhouette, Gin-iro no Harmony), a creator of classics in the shoujo manga magazine Ribon. Tsukushima Shizuku discovers that all of the books she checks out from the school library have been checked out by a person named Amasawa Seiji. She wonders who he is.... he likes all the same things as she does. Is he nice? What does he look like? One day Shizuku returns to class after leaving one of her books there, and finds a boy sitting on her desk reading it. She doesn't like him very much at all because of his teasing comments. That day she meets a curious cat riding the bullet train, and follows him to a quaint shop high on a hill. 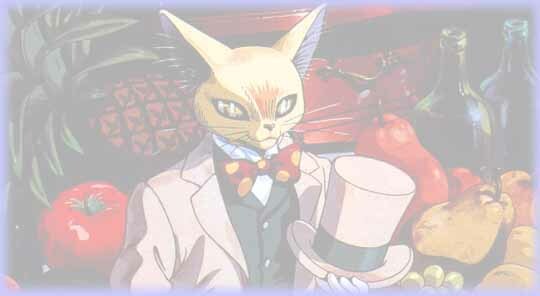 Inside is a statue of a cat called the Baron, which inspires Shizuku to write her first novel. It turns out that the owner of the cat is Amasawa Kouji, and his younger brother is the boy she saw in the classroom.... whose name is Seiji! The sequel book contains a story of Shizuku and mysterious wings she sees in the Amasawa's house. She magically finds herself in a library full of cats, including the Baron.... or is it a dream? 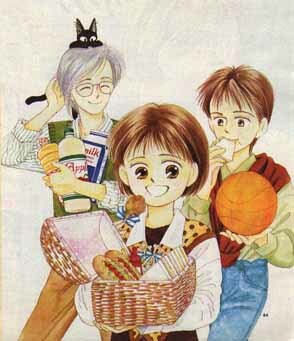 Seiji, Kouji, and their grandfather appear as well. Shizuki is a heroine one can relate to very well. 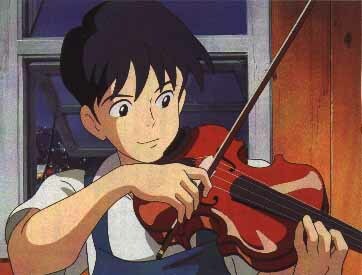 She's approaching the all-important high school entrance exams and realizes that she doesn't know what she wants to do with her life, unlike Seiji, who does violin crafting. She had gone along until now just doing what everyone else did, but this is a crossroads of her life. She can go to high school, go abroad, or enter the working world. She comes to the decision that what she wants to do is write, so she sets upon the task of penning her first novel. She is very unsure of her work, whether it's good, whether she'll fail... if she fails at what she loves most, what will she do? Even at the cost of possibly ruining her shot at a good high school, she knows she needs to find out who she is and what her goals are before choosing to go on to high school or not. It would take courage to make such a choice. Everyone knows to study extra hard for exams, but she is spending the time writing first, even though it'll give her much less study time. If you understand how major the exams are to Japanese students (it's very stressing, some people have even commited suicide) you know what a hard choice it would be to go against the flow. To worry your parents who know that passing or not may determine your life's future. 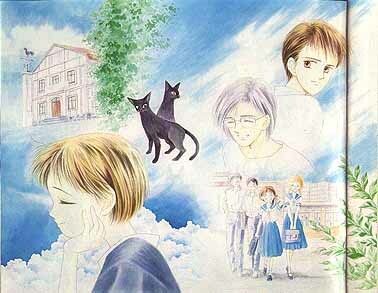 The manga has many differences from the movie, including Seiji's older brother and 2 cats rather than 1, so fans will definitely enjoy both versions. If you are familiar with anime in general, you know that the Studio Ghibli films are of the highest caliber and filled to the brim with lovely details and emotions of life. This is a film not to be passed by.